Medievalism -the appropriation of elements of medieval culture - has a long history: every century since the sixteenth has remade the Middle Ages in its own image. 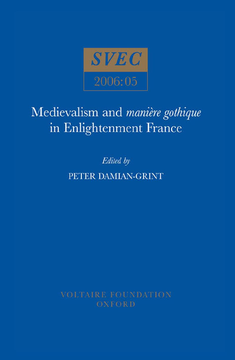 But different generations look back to the medieval period for different reasons, and each successive generation finds a different 'Middle Ages', a Middle Ages that says more about that generation's own aspirations and anxieties than it does about the medieval period itself. What does eighteenth-century medievalism tell us about France at the end of the Ancien régime? The cliché is well known: in Enlightenment France, the Middle Ages - those 'temps grossiers' dividing Classical times from the Renaissance - were universally despised as a dark age of bigotry and barbarism. But historical clichés are often the result of reading the past backwards. Relegated to the dust-heap of history by Enlightenment intellectuals, the Middle Ages in fact held a remarkable attraction for readers and audiences of the time. This wide-ranging book charts some aspects of the surprisingly broad influence of medievalism on the scholarship and popular culture of eighteenth-century France.